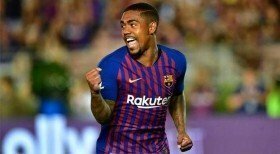 Arsenal are understood to have made an attempt to sign Malcom on loan from Barcelona, though they were put off by the Blaugrana's demands for the same. The Gunners confirmed their first winter signing earlier today after they agreed on an initial £2m loan fee to sign Denis Suarez from the Spanish champions. According to The Sun, the north London side are thereafter said to have made an enquiry to sign Malcom but they were left 'astonished' by the demands from the Catalans for the temporary move to go through. It is added that cross-town rivals Tottenham Hotspur were also keen on a late swoop but they have likewise followed the Gunners' suite despite making no signings in the current season. Arsenal have been keen on pursuing another wide player before the transfer deadline but they seem far off from signing anyone after recently failing with loan bids for Ivan Perisic and Yannick Ferreira Carrasco.